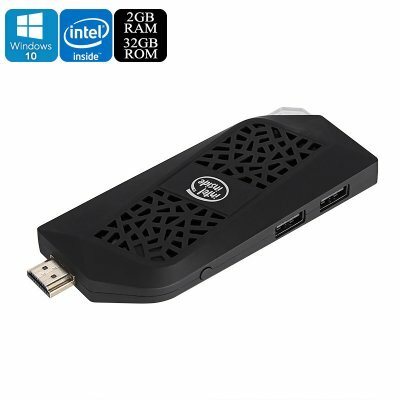 Successfully Added MEEGOPAD T08 Windows Mini PC - Unlicensed Windows 10, Intel Atom CPU, 2GB DDR3L RAM, WiFi, 1080p Support, Bluetooth 4.0 to your Shopping Cart. Turn any big screen TV into your own personal computer with the MEEGOPAD T08 Windows Mini PC. With its HDMI 2.0 port, this Windows TV Dongle can be easily inserted into your television. Once in place, it allows you to enjoy all the regular Windows 10 features from your large screen television. The MEEGOPAD T08 comes with an unlicensed version of Windows 10 pro that is capable of handling all the trusted MS Office features as well as basic games and windows programs. With this Windows mini PC at your side, you’ll be able to carry along your personal files anywhere you go. This TV dongle packs an Intel Atom Cherry Trail X5-Z8350 CPU that has been clocked at 1.84GHz. The processor is backed up by 2GB DDR3L RAM that, together, are capable of setting forth an impressive performance. Whether you wish to use this Windows TV Box for business or entertainment, it is sure to meet all your demands. You will be treated to 32GB ROM and 128GB SD card support. Additionally, you’ll be able to connect it to a 500GB external hard disc. Thanks to this, you’ll never have worry about running out of storage for your files, games, and films. With its Bluetooth 4.0 support, this Windows Mini PC can be easily synchronized with your smartphone and other external devices. It supports 1080p media thanks to which it’s great for enjoying films and series. With its Dual-Band WiFi connectivity, it even allows you to browse the web straight from your television set. This means that you’ll be able to download files, stream media, and stay connected with your friends and family through social media. The MEEGOPAD T08 Windows Mini PC comes with a 12 months warranty, brought to you by the leader in electronic devices as well as wholesale TV boxes..